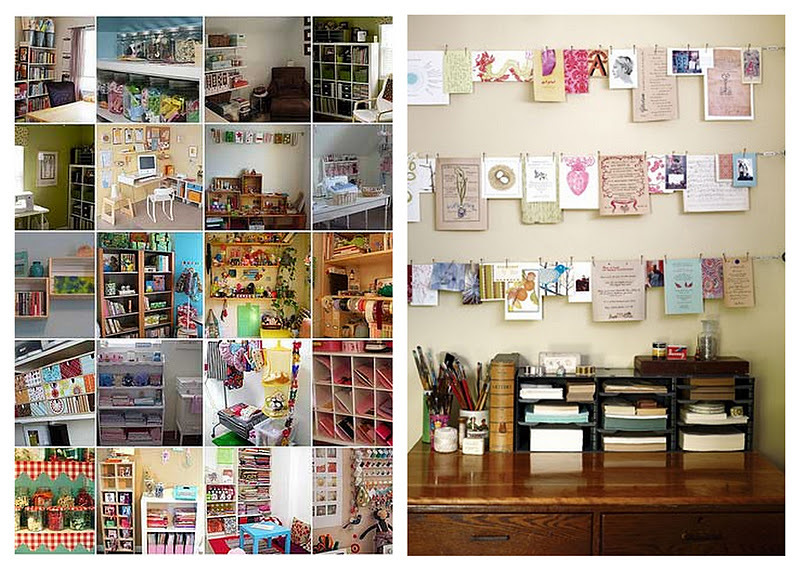 Today, we drool over Michelle's inspiring new work space! For several years I've made do with storing my craft supplies in plastic tubs and hauling them out to the coffee table when it was time to craft. With our most recent move I was determined to claim a corner in the house to build a craft studio where I could unleash the magic..the crafting magic, of course. We were fortunate to find a two bedroom townhouse with the perfect amount of space in the extra bedroom for two desks: his for schoolwork, hers for crafting (her's is way cuter). 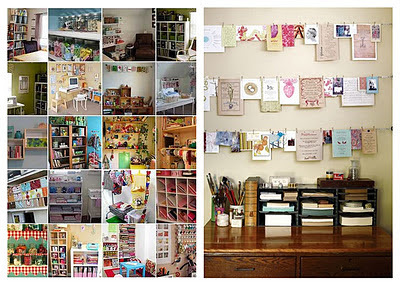 My biggest inspiration for creating this space was Inspired Honey Bee's studio. 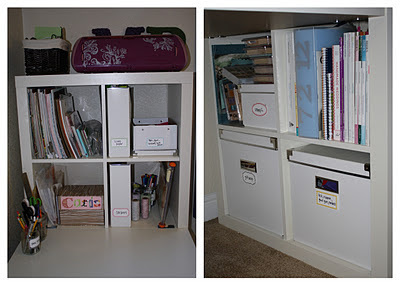 I spent a lot of quality time in there and knew when we had space I wanted it similar to hers. I also found lots of great inspiration on Pinterest. The goals for creating my studio were to store all my supplies in an organized and easy accessible fashion, have ample space to work on projects and an area to display items that inspire my creativity/make me smile. After I built the desk, rather than dealing with the huge mess of supplies, I hung two pieces of rope and pinned up my favorite cards, prints, pictures and stickers. Over the next few weeks I slowly began organizing all my supplies into boxes and magazine holders also purchased at Ikea. I used these cute free stickers to label all the supplies. Here's a peek at the shelves (only organization lovers, like myself, will appreciate this photo). I have a feeling over time these items will all get moved around, but for now this works! I used small mason jars to hold supplies that I use often, like pens, pencils, scissors, ruler and bone folder. Last but certainly not least, I framed the PS motto Do Something Creative Every Day that sits on the corner of my desk. This is my reminder to make time to do what I love. I made a similar reminder for my creative soul sister's craft studio. Although we can't craft together as often, it makes me happy to know we both have well organized places to do what we love!